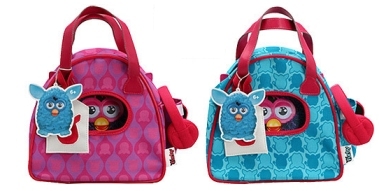 Children can carry their Furby wherever they go with the Furby Sling Bag carrier. An eye level window in the bag allows the Furby to see out whilst the headset (included) allows Furby to pretend to listen to music. A side pocket can be used to carry any phone or MP3 player (sold separately). Available in either Teal Blue or Pink colours. Dimensions 5" Length x 5.3" Width x 6" Height. Only really available in the UK at eBay with variable prices typically currently ranging from £15 to £20. 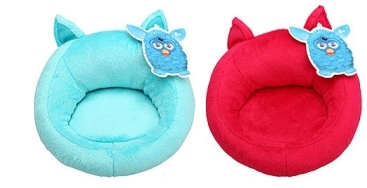 Provides Furby with a comfortable seat to keep it happy! A plush valboa material with polyester filling and is modelled on Furby and features it's ears and tail. Dimensions 6.25" Length x 5.75" Width x 4.25" Height. Only really available on eBay in the UK with variable prices typically currently ranging from £10 to £15 (with some auctions going for less). Personalise your Furby with two pairs of glasses and stickers. Different colours and shapes of frames are available in each packet so choose carefully! Again, only really available on eBay in the UK with variable prices typically currently ranging from £10 to £15 (with some auctions going for less).